Honor has been gaining reputability with each of its phone releases over the last few years, establishing itself as an affordable player in a bustling market. But just because its devices are affordable doesn't mean it's a cheap-and-cheerful brand. One look at the remarkably well-priced View 10 is enough to tell you that. However, Honor sits in a slightly odd place: existing in the proverbial shadow cast by parent company Huawei (a Chinese behemoth, if you don't know of it), the devices launched by the two interrelated companies are more than a little similar. Indeed, the View 10 is like a slightly diluted Huawei Mate 10 Pro in a new shell. Which, as a positive, means there's a shed load of top-tier tech crammed into this cut-from-a-different-cloth Honor device - and for a fraction of the price. Honor is always tweaking its device design. Not so long ago the top-tier device the company offered was the Honor 8 Pro - which roughly aped the iPhone 8 Plus in physical dimension terms - which sees itself completely undercut by the slimmer, tidier View 10. The design language has progressed and the new phone is a good looking slab of metal. 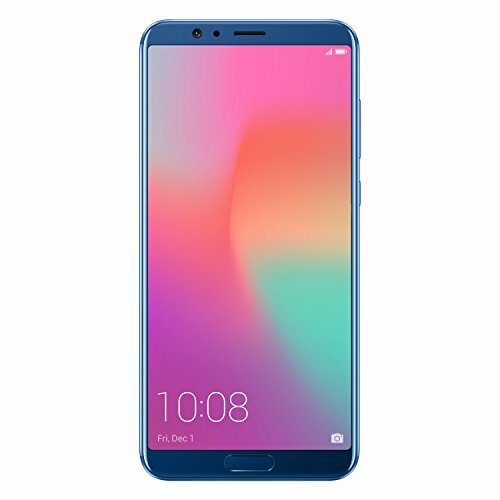 There's still a sense of experimentation though: while the earlier mid-level Honor 9 dazzled with its reflective blue coat - something we thought would become an Honor trademark, but which hasn't happened - the 8 Pro opted for an altogether more soft, subtle blue veneer. And the View 10? It's even more demure than that, the blue shade coming across even more subtly. We like it a lot, but a consistent message across colour and finish would give the brand an altogether tidier know-what-you're-getting reputation. What's particularly great about the View 10 - and this is what makes it that much more slender compared to the 8 Pro - is its 6-inch 18:9 aspect ratio screen. Sure, this is nothing new - we've seen a variety already, from the Huawei Mate 10 Pro, to Samsung Galaxy S8, LG G6, and beyond - but it creates an elongated frame that's great for single-handed holding. If you're thinking "oh, a 6-inch phone, isn't that going to be big?" then the View 10 is here to persuade you that's not the case. It's a slim device, too, measuring just under 7mm, keeping it in line with its near flagship competitors across the board. At this thickness (more thinness) Honor could have been tempted to remove the headphone jack - we're looking at you Apple; and, yes, Huawei did the same in the Mate 10 Pro - but the 3.5mm opening remains, neatly tucked into the base of the device (which has been a godsend for when our Bluetooth headphones have run out of battery). The View 10's screen-dominant design looks great from the front, while the back is generally well considered too. The antenna bands wrap around the top and bottom of the device, barely noticeable (or at least enhancing the shape of the device), while the product is convincing as a single piece (even though it's comprised of panels) to make for a top-end look. Even the Honor logo, which appears all in lower case, is kept subtly engrained into the rear centre - there aren't several of them littering the face and rear of the product. Phew. There are a couple of problems though: the two protruding camera bumps to the rear look poorly considered and aren't especially tough either - we've scratched their outer edges from constant use in and out of our pocket. Then there's the front-facing fingerprint scanner which, while certainly a welcome feature, is really poorly positioned by the base of the screen: it's far too easy to accidentally press it instead of the screen itself and, ultimately, this scanner should have been positioned on the rear (round about where that Honor logo is, incidentally), in a similar fashion to the Huawei Mate 10 Pro. Given that the View 10 will return a pound from your £450 spend, you might not expect it to have the spec of a £800 phone. But it does. There's Huawei's top-tier processor on board, paired with 6GB RAM as standard, alongside a considerable 128GB storage - and there's even a microSD slot (or it's SIM slot number two if you prefer dual cards) should you want to further increase that - which altogether makes great value for money. There's no distinctive corner-cutting to be seen either. That 6-inch screen is every bit as resolute and capable as you'll find in other flagship phones on the market. It even offers colour adjustment in the software to ensure it suits your preference for a warmer or cooler appearance. Viewing angles are good, brightness ample, and the latest software doesn't go overkill on auto-brightness adjustment either. It's all rather well balanced and there's no greasy fingerprint issues like the Huawei P10 suffered. As demanding games go - we've recently become obsessed with South Park: Phone Destroyer, because it's rather brilliant (and rather infuriating) - that Kirin chipset eats everything up with ease. Crucially the phone doesn't get too hot either, which is a result we've seen of so many other high-end phones. Not so the View 10. As it's not over-cooking things behind the scenes the battery holds up well too. That's no surprise given the large capacity, but perhaps our sights were set on this Honor matching the lofty longevity heights of the Huawei Mate 10 Pro. While it can't quite manage to equal longevity of its Huawei cousin, the View 10 has settled in well - and actually improved over time, thanks to software updates. We're now getting around 16 hours per charge of day-to-day use, including with some ad hoc gaming fun thrown in during the day, alongside the usual work and messaging tasks. If you're a total power user then some of the baked-in battery software can help the View 10 extend its life yet more. Whether automatic low-resolution use for specific apps, manual application of battery throttling, or optimisation suggestions to kill apps when not in use, there are plenty of options and customisations. When we say the word "software" relative to a Huawei/Honor product, it can strike fear into the hearts of those who knows about Huawei's EMUI software platform - it's well known for being rather, er, forward in its notifications, suggestions and alerts. To the point that it just gets plain boring. Thankfully, over time, the company has ironed out its platform to deliver a solid experience that's now fairly similar to the Android 8.0 operating system on which EMUI 8.0 sits. That means fewer unnecessary alerts, less fuss in general, and a cleaner overall user experience (if you're not a massive Android geek then, frankly, you're unlikely to notice too many differences - in a good way). EMUI 8.0 does add some quirky features that can come in handy: gesture controls via the fingerprint scanner, App Twin for doubling-up personal and work apps (such as WhatsApp, Facebook Messenger, and so forth), refined app notification management to suit your preferences, and more. Some wannabe Apple features - such as Face Unlock, which attempts to use an image of your face to unlock the screen, but which fails more than it is successful - don't quite cut the mustard, however. The absence of App Drawer by default (it can be added for a more stock Android-like experience) may also make your screens busy, but that's a case of preference whether or not you switch it on. Ever the big deal in phones these days is the camera arrangement. This Honor pulls much of Huawei's blueprint over into the View 10, delivering the dual-lens setup to cater for both colour and black and white photography. They're different resolutions (which doesn't really matter) and both optics offer an f/1.8 aperture, which is handy for shooting in low light - and not a million miles behind the current top-spec flagships. The View 10's camera offering isn't a carbon copy of the Leica setup found in its Huawei cousins though. There's not the Leica sign-off, for starters, meaning the German camera maker hasn't put pen to paper to say that these are the very best lenses going. And, as we said, their poor positioning and generally malleable exterior - the paint chipped off in a matter of weeks and small bends could be seen despite not dropping the phone - doesn't exactly help matters. But the View 10 has proven robust enough to outlast a few scuffs. So long as those lenses are clean the image quality is rather admirable for what's effectively an upper mid-level phone - and the auto scene recognition is rapid thanks to so-called "AI". We still think images are a little too harsh on the over-sharpening to try and relinquish general lack of detail - just look at the 100 per cent crops, i.e. actual scale - and auto-exposure is a little on the overexposed side of things (not dramatically, though). Nonetheless, we've shot some great images in both good light and limited light without issues. The phase-detection autofocus helps with that - not that you'll be shooting professional sports photographs or anything - but it's snappy enough to lock on in good time and the lack of shutter lag is great. We've even hand-held shots in a nightclub with usable results. In addition to colour and mono, the dual lenses can also be used to capture a depth map and produce software-based background blur - otherwise known as bokeh - for supposedly more pro-looking shots. Simply select the "six triangles in a circle" (looks a bit like a Laughing Cow cheese ring) icon within the camera to set this mode into effect, which permits pseudo aperture setting from f/0.95-f/16 (the smaller the number the more significant the blur). As we've said of all these software solutions, for more complex scenes this mode can render things a bit of a mess, especially when looking at the shots in 100 per cent scale. If you've been eyeing-up the Huawei Mate 10 Pro but have been receding due to its price tag then, well, the Honor View 10 offers much of the same at a cut of the price. As sub-£500 phones go there are few more accomplished and capable. This upper mid-level market is becoming rather competitive, though, with the OnePlus 5T also making a considerable dent in the market - and for even less cash. Sure, the OnePlus is bulkier, but there's something about that well-established phone series that Honor almost - and we really mean almost - manages to outsmart in the View 10. And let's now forget Samsung hanging the wings with its incoming A5 model, which is of a similar ilk to the Honor, albeit minus the EMUI software setup that some may find a little taxing. Overall, however, a solid month of use with the View 10 as our day-to-day phone has proven just how capable this device is. We've never been left wanting in terms of power; longevity per charge has actually improved over the course of time thanks to software updates; and that elongated screen ratio sees this device nestle neatly in among similar flagship devices without so much as blinking an eye. Sure, some of the View 10's software is quirky (Face Unlock is approaching pointless, for example), those dual camera bumps look plain weird, and the fingerprint scanner is poorly placed - but fix up these minor issues and Honor has a true five-star affordable flagship on its hands. Especially if it comes in Honor 9-style spangly blue next for the future follow up. It's impossible not to mention the OnePlus as the Honor's prime competitor, especially in its 5T form which brings the elongated 18:9 aspect ratio screen into play. Between the two there's not a huge deal of difference: software, price and brand awareness will all come into play. They're the same price, too.